The clean design and accessibility of these Double Sided Grid Bike Racks enhance streetscapes while promoting community bicycle ridership. 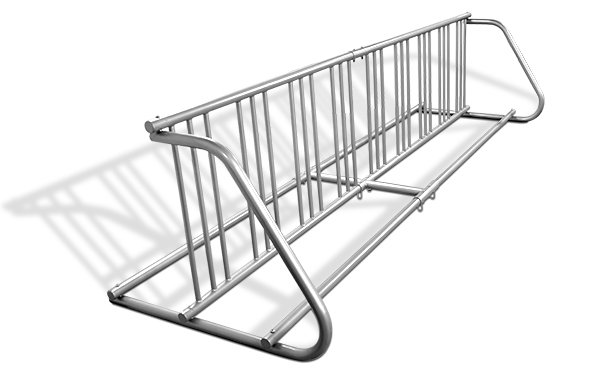 These Grid Style Bike Racks are ready to ship when they're needed the most. Grid models ship direct, flat and fast! Provides a quick cost effective solution for the growing demand of bicycle parking. These models are lightweight making them highly portable allowing quick and easy placement where they're need the most. Created from commercial grade steel these imported grid racks have welded grid panels and precision bent frames showcasing their high level of strength. The steel is protected with a reliable corrosion resistant powder-coated finish that shields against rigorous use.